For this recipe, I'd look for 1 or 2 large pieces of fish fillets. The piece(s) get a partial cook on one side before being set into the broth to finish cooking at the end. Thicker pieces are more succulent and obviously harder to over-cook, and the aim of the dish is to cook the whole fish fillets gently all the way through and then divide it into 3-4 portions when serving. I started cooking the fish in a non-stick skillet but switched over to a dutch oven midway. I know this is finicky and an added step; you could certainly continue the recipe in one pan as long as it's large enough (and preferably has a lid; otherwise you could use a baking sheet to cover) to hold all the ingredients. I simply preferred using the non-stick to easily cook the fish with less oil but then I wanted more space and a tight fitting lid so I continued the rest of the way in a deep dutch oven. It depends on what you think is easier. When it's all done, ladle the sauce onto the bottom of your serving bowl and then lay pieces of fish on top. Other suggestions for serving include some boiled potatoes and yucca alongside. I really liked the hearty brown rice with mine but any bit of starch you prefer would work well to round out the meal. Sprinkle fish with 3/4 teaspoon curry powder, about 3/8 teaspoon salt, and 1/8 teaspoon black pepper. Rub mixture over both sides of the fish. Heat a large nonstick skillet (preferably one with a lid) over medium-high heat. Add oil to the pan and swirl around. Add fish to the pan and cook for about 4 minutes, until fish is well browned on the bottom but not yet done (you are not flipping the fish over; it will finish cooking later in the sauce). Remove fish from the pan on to a plate and set aside. Add onions and bells pepper to the pan. Cook for 4-5 minutes until vegetables are tender. Add ginger and garlic, then cook for another minute. (At this point, I transferred the mixture to a dutch oven for more space and use of a lid). Add remaining 3/4 teaspoon curry powder, another 3/8 teaspoon salt and 1/8 teaspoon black pepper, tomato, and lemon juice. Reduce heat to medium-low and cook for about 10 minutes, stirring occasionally (I covered the pan to trap in the moisture). You're looking for the tomatoes to break down and release some its juices. Mash tomato a bit more with a wooden spoon. Stir in the coconut milk. Return fish - browned side up - along with any juices, to the pan. Reduce heat to low and cover, letting fish cook gently until cooked through and flakes easily with a fork. This should take 6-8 minutes. Taste the sauce and adjust seasoning if necessary. To serve, spoon sauce into shallow dishes. Break off big chunks of the fish and place on top of each portion. Serve with lemon wedges. Garnish with cilantro or parsley and serve with rice, if desired. Oh how I wish we lived close to each other. I would love being your taste-tester! I agree that these grey days may be behind my need for full flavored dishes and this sounds like it would hit the spot. The fish looks so tender and well seasoned. Lovely! On one day, seeing two versions of deliciousness like the almond roll and this one, I am convinced that I need to move somewhere closer to you. Fish and coconut are a match made in Heaven. This is my kind of curry. Love how simple it is to make. These cold and grey days are making me crave comfort food too! I've never tried making a fish curry at home before (only chicken, beef or chickpea) but used to always order it when we went out to eat. Yours looks so flavorful and delicious! I like that you pan fried the fish lightly too and I can just imagine the wonderful aroma that filled your house! I'd love a big bowl of this comforting dish to warm up with! I have cod in the freezer and I´m also always searching for some dinner idea with fish. Do you think I can use the thai red curry paste for that? Or it´s better to use the powder? Hi Karla - I'm sure you could switch it up and use curry paste. I'd just sear the fish with salt & pepper like the recipe says and then work your curry paste into the onions and peppers before adding the light coconut milk. Sounds tasty!! I have a tin of coconut paste in my pantry that I've yet to use so you are inspiring me. This is not only comforting, also very delicious and healthy! I love that combination, too, Angie. I wish you were my neighbour! This is the perfect food I want cooked for me right now. So warming and flavoursome. What a great dish Monica! Hello Monica, It seems like my comment has not gone through so trying again. 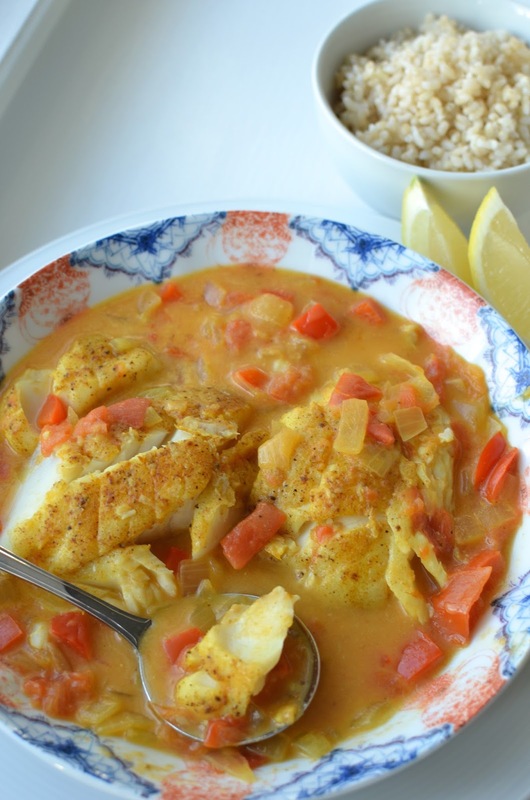 Your fish curry is absolutely gorgeous, warm, comforting and delicious. I love how tender your fish is and it just flakes with your fork. I know it is only breakfast time but I would love a big bowl right now, after all I do live in Asia so fish curry for breakfast is kind of normal... sharing of course!!! You are so kind, BAM. Thanks for going to the trouble of re-submitting your comment. And you're so right - everything is up for grabs for breakfast in Asia...from seafood to rice to sweets. I love it! Take care! I always keep some naan in the freezer because it goes with so many things! Thanks so much! Yummy! Adding coconut milk always gives great flavor. I will your recipe try one of these days. This is such comfort food - and an abundance of flavor! Thanks, Ashley. You take care! This looks wonderful, and reminds me of a dish my mom made when I was a kid. Yum! Anything that reminds you of mom's cooking has to be a good thing. Thanks, Beth. I've been craving comforting foods too lately - must be the cold weather!! :) This looks so so flavorful! In Brazil we used to have similar dishes, but without curry...somehow fish and coconut milk taste delicious...and yours sure looks awesome Monica. Sounds fabulous, Juliana! Have a great weekend. This is such an interesting recipe, I can't wait to try it! Thanks, Amanda. I've had fun trying savory recipes out in the last few years. Curry really is so warming in these winter months! I made some popcorn tonight and was so sad when I went to sprinkle some curry powder on it and it was all gone! 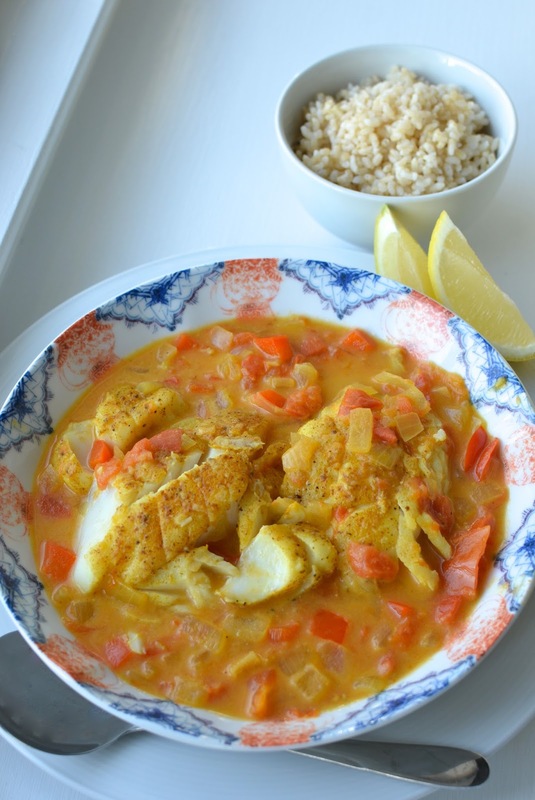 It is freezing in the house tonight and I wish I had some of this fish curry! I love curry on so many things...I've never tried popcorn though! It sounds awesome! Monica, this is such a great looking curry. I never knew that Tanzanian cooking uses a lot of Indian spices. That's close to home. Loving the color of the curry. I have some prawns at home, I might try it. Thanks for sharing a wonderful recipe. Have a great week my friend. It's great to bump up the flavors of lighter food like fish with spices. Glad you like it, Monica. I bet your fish curries are mighty tasty!